Is Tin the New Energy Metal? 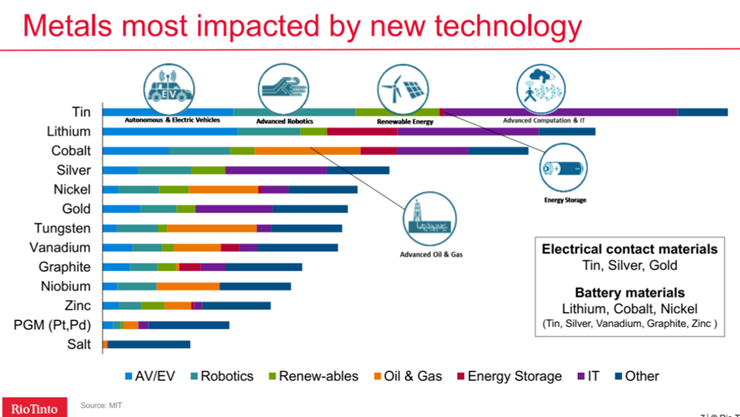 At a recent Lithium and Battery Material conference held in Perth, Australia the head of Rio Tinto’s Venture (“RTZ”) group presented a chart from a Massachusetts Institute of Technology (“MIT”) study they had commissioned to determine what metals and minerals were to be most impacted by new technologies using a number of criteria. Surprisingly, tin ranked #1 in the MIT study (see chart). The question is what was the reason behind their choice to rank tin #1? It seems that every day there is a new technology that changes the demand landscape for existing materials. Lithium, of course, is the most recent and best example of a new use for an old material that has driven the price of it much higher due to increased demand. In markets where supply is constrained the effect on prices is even more exacerbated. This argument can be made for tin as prices in the early months of 2018 have risen to over $21,000 per tonne. There is a steady, rising trend of tin use in electronics and new strong indications that it will be used in emerging technologies coupled with a static supply curve has led to strengthening prices. Tin is expected to increasingly contribute to modern, clean technologies including lithium-ion batteries for autonomous and electric vehicles. What is shaping up to be the wildcard is the battery market where advances have been made in battery technology. For instance, tin is used as a component in improving the productivity of lead-acid batteries. In 2016, China consumed 12,000 metric tonnes of tin for this application and globally 26,000 metric tonnes are consumed annually, and this number is rising making it the 4th most significant application for tin globally. To put this in context, the annual global mine supply of tin in 2017 was 280,000 tonnes. Also, battery researchers are developing solid-state batteries utilising ceramic electrolytes (versus liquid) for improved safety and performance. Recent research has shown that adding tin to the silicon-based anode enhances its performance, creating the potential for tin to be a significant contributor to the next generation of lithium batteries. As noted by Avalon Advanced Materials Inc. in their Industry Bulletin dated March 27, 2018, researchers at the Texas Material Institute have demonstrated a tin-aluminium alloy can be produced that is cheaper and double the charge capacity of today’s copper-graphite anodes for lithium-ion batteries. Based on information from an independent NI 43-101 resource calculation completed in 2017, tin values account for 50% of the contained metal in BacTech’s Telamayu Tailings Project in Bolivia. BacTech is optimizing its processing methods on the material at Telamayu to unlock the maximum amount of metal for recovery, which is anticipated to include not only tin but silver and copper. BacTech has been advised by the University of Oruro in Bolivia, which is an accredited lab, that our latest results which will detail metal recovery to date will be available for dissemination in the near future. Work is underway to add to our tin tailings holdings in Bolivia, a country that historically been one of the largest tin producers in the world.